Participants of the top workshop at lepton colliders Top@LC2017 at KEK. The top quark is one of the pillars of the physics topics that linear colliders address. With its large mass of about 175 GeV the top quark is the heaviest particle in the standard model – even heavier than the Higgs boson. Its value suggests that the top quark may have something to do with the reason why the Higgs field froze to a certain value, giving masses to elementary particles. Many theoretical models beyond the standard model have their smoking guns appearing in the properties of the top quark. At a linear collider top quark pairs would be produced in clean electro-weak production, a distinct difference compared with the LHC, which supports considerably the discovery of new physics. From July 6 to 8, 2016, the ‘Workshop on top physics at the lepton colliders’ was held at KEK. This was the fourth in the series and the first time that the workshop was held in Asia. 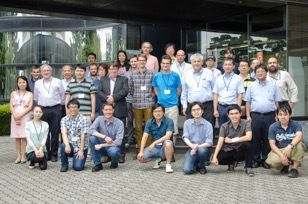 More than 40 experimentalists and theorists from three regions who are actively engaged in top quark studies at lepton colliders gathered together to participate in vigorous discussions. An international committee put together the program that also included reviews of incoming results from the LHC. Even though the size of the meeting was modest, it was the right size to focus on well-defined topics. The workshop was jointly hosted by KEK and Tohoku University and supported in part by a JSPS program ‘international studies on top physics at linear colliders’, the virtual French-Japanese Laboratory TYL/FJPPL, and the E-JADE program. In 2017 the workshop will be held at CERN.